ScottsMiracle-Gro associates welcomed spring with the 6th Associate Gardens at the Marysville headquarters. To date, associates have worked closely with local food banks to donate more than 20,000 pounds of fresh produce from the gardens to area residents in need. More than 400 associates will tend to garden plots this year and will harvest from over 3,000 square feet of growing space. "Plant Day is an especially great day here at ScottsMiracle-Gro because it gives our associates the opportunity to engage in what our company is all about," said Chairman and CEO Jim Hagedorn in his opening comments at the event. 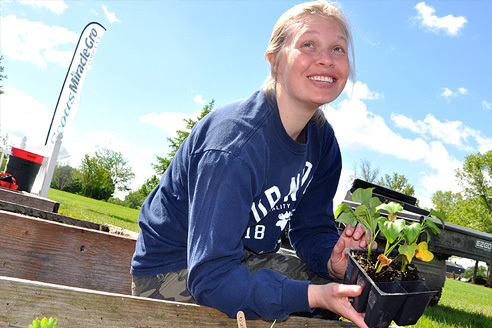 The Give Back to Gro Associate Gardens are a part of ScottsMiracle- Gro's continued efforts to give back to the community and to create a workplace that promotes wellness and opportunities to enjoy the outdoors through gardening and green spaces.